Judith ‘found’ dance (international folk) about 25 years ago, but then struggled to discover which of her many ‘left feet’ was actually her ‘right’ foot! That finally sorted, she has immersed herself in as much Klezmer Dance as living in a small Pennine town allows – with two trips to Weimar to specialist Klezmer dance workshops significantly expanding her repertoire, as well as the week-long Klezmer dance workshop with Erik Bendix in Findhorn this summer. Judith has taught and led dance for many years, and is committed to spreading and encouraging Klezmer Dance, finding it such an inclusive and uplifting dance form. 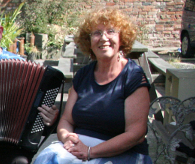 Judith was a founder member of KlezNorth, and is taking a well-deserved rest from organising this year to focus on the dancing and the different joys of being a participant.